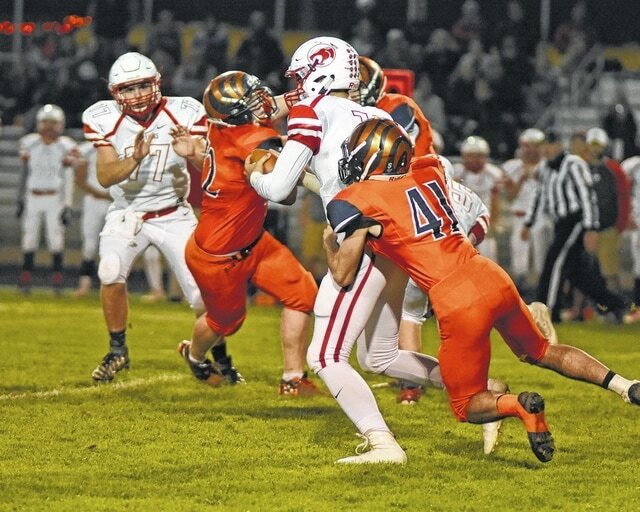 GALION — Galion is looking for it’s third win of the season when it travels to Richwood on Friday to take on North Union. The Wildcats are 5-3 overall and 2-3 in the Mid-Ohio Athletic Conference Red Division after falling to Jonathon Alder last Friday. Last week, Galion beat Fairbanks 28-25 to snap a six-game losing streak and to celebrate homecoming at Unckrich Stadium in Heise Park. In that game, Galion gained 269 yards on the ground. Leading the way for the Tigers was Garrett Kuns, gaining 150 yards on 21 carries. Ryan Talbott was also busy, carrying the ball 10 times for 69 yards. Cooke didn’t have many yards gained via the run, but had all three rushing touchdowns. Cooke was 8/17 passing on the evening with 201 yards. The touchdown was Crisman’s only reception on the night. Harrison Ivy had three catches for a total of 124 yards. In total, the Tigers racked up 470 total yards on 66 plays from scrimmage. Defensively, the home team allowed just 19 rushing yards on 10 carries. The damage caused by the Panthers came mainly through the air. Quarterback Kyle Warner showed why he was the top passing QB in the MOAC, going 28/49 for 351 yards. Warner threw three long touchdown passes on the night, but also threw interceptions to Kuns and Harrison Ivy. NORTH ROBINSON — Colonel Crawford heads to New Washington to take on the Buckeye Central Bucks in week nine. Colonel Crawford is 6-2 overall after last week’s 47-20 win over Lucas. Buckeye Central is 2-6 after edging out Bucyrus last week, 41-40. In the Eagles win over Lucas, they continued their potent rushing attack. Blake Treisch carried much of the load for the Eagles, rushing for 205 yards and scored four touchdowns on 28 carries. Trevor Shawber picked up 80 yards on nine carries and added a touchdown of his own. Quarterback Hayden Bute had 50 yards rushing on nine carries. In total, Crawford had 334 yards rushing on 47 carries which accounted for five of the team’s seven scores. Bute threw the ball just nine times against the Cubs for 51 yards and two touchdowns. Kaleb Landin picked up most of the receiving yardage for the Eagles with 41 yards on two catches and a score. Kyle Shope had the other touchdown on his only catch for six yards. On the defensive side of the ball, Crawford held the high octane Lucas offense to just 228 yards on 39 plays. The Cubs completed threw the ball four times on Friday, complete just two of the four for 38 yards. On the ground is where Lucas did any sort of damage, carrying the ball 35 times and grinding out 190 yards with three touchdowns. FREMONT — Crestline is looking for win No. 4 on Friday night when it travels to Loudonville to take on the wineless Redbirds. In the midst of a four-game road streak to end the season, the Bulldogs lost last week to Fremont St. Joseph Central Catholic, 30-16, in non-league battle. Wolfe threw the ball 21 times in the game, completing just eight of the throws for 158 yards and one interception. Top receiver on the night was Davon Triplett with four catches for 96 yards. Chandler Gaskill caught himself two passes en route to 54 receiving yards. In total, the Bulldogs gained 353 total yards in offense against St. Joe’s. MOUNT GILEAD —Still looking for its first win of the season, Northmor hosts Fredericktown this week. The Freddies are 3-5 overall and 2-3 in Mid-Ohio Athletic Conference Blue Division play. Last week, Mount Gilead outlasted Northmor to win a 55-40 shootout. The two teams combined for nearly 900 yards of offense. Northmor rushed for 303 yards on 26 attempts, led by Demetrious Johnson, with 223 yards and three touchdowns on just 8 carries. Conan Becker gained 44 and quarterback Jordan Wiseman 36 and ran for a touchdown. Wiseman was 7 of 16 passing for 69 yards, two touchdowns — to Garrett Gillespie and Nathan Hall — and two interceptions. On defense, the Knights gave up 465 rushing yards on 67 carries. Jonah Barnett rushed for 287 yards on 32 carries and scored five touchowns. Tyler Bland rushed for 96 yards and Anthony Clark ran for 82 yards. Galion receiver Caleb Ivy picks up yardage against Fairbanks during homecoming action Friday night at Unckrich Stadium. Photo by Don Tudor. http://aimmedianetwork.com/wp-content/uploads/sites/38/2016/10/web1_Galion-vs.-Fairbanks-2016-1.jpgGalion receiver Caleb Ivy picks up yardage against Fairbanks during homecoming action Friday night at Unckrich Stadium. Photo by Don Tudor. Galion linebacker Kelby Knight tries to wrap up the Fairbanks quarterback Friday night at the Tigers’ homecoming game. Photo by Don Tudor. http://aimmedianetwork.com/wp-content/uploads/sites/38/2016/10/web1_Galion-versus-Fairbanks-2016-1.jpgGalion linebacker Kelby Knight tries to wrap up the Fairbanks quarterback Friday night at the Tigers’ homecoming game. Photo by Don Tudor.